When will be Shock Trauma: Edge of Life next episode air date? Is Shock Trauma: Edge of Life renewed or cancelled? Where to countdown Shock Trauma: Edge of Life air dates? Is Shock Trauma: Edge of Life worth watching? It's a matter of life-or-death in Discovery Life's "Shock Trauma: Edge of Life", premiering Friday, January 1st at 10/9c. The unscripted docudrama tells the parallel stories of doctors, nurses and patients at the world-renowned R Adams Cowley Shock Trauma Center at the University of Maryland Medical Center in Baltimore. With a 97-percent survival rate and more than 8,000 patients annually (compared to the typical 3,000 per year) it is the best trauma center in the country. Only the most critically-injured patients in Maryland are transported here, and in the fight to save lives, or prevent irreversible damage, every minute counts. 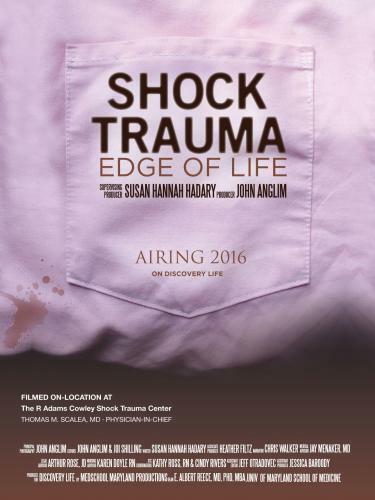 Shock Trauma: Edge of Life opens the doors of the world renowned premiere trauma center and captures life's unexpected circumstances. In the series, the Shock Trauma Center treats motorcycle, car and ATV crashes, frostbite, gunshot wounds and even victims of violence from the April 2015 protests in Baltimore. 13 year-old Thomas is unconscious and unresponsive from a car crash. Ashley, an adrenaline junkie, pays the price when she crashes her motorcycle. Young professional Josh has both feet amputated by a train. Baltimore protests spread rapidly through the city bringing patients who have life threatening injuries. Shock Trauma: Edge of Life next episode air date provides TVMaze for you. EpisoDate.com is your TV show guide to Countdown Shock Trauma: Edge of Life Episode Air Dates and to stay in touch with Shock Trauma: Edge of Life next episode Air Date and your others favorite TV Shows. Add the shows you like to a "Watchlist" and let the site take it from there.